1.The annual anniversary of the day on which a person was born. 2.The day of one’s birth: “she shares a birthday with Paul McCartney”. 3. A day to eat, drink and be merry with those you love and brought you into this world. Okay, yeah. Number 3 is my own addition to the definition. And I do not share a birthday with Paul McCartney, but I DO share a birthday with a few other peeps you may know. But more on that later. Today is my 28th birthday. I hate even numbers (except 4. I like 4. I’m a total weirdo, let’s not get into it.) so 28 isn’t really anything to get excited about as far as I’m concerned. It just means I’m one year closer to 30, ugh, dreaded 30. I suppose it’s not really a dreaded number, I just always feel like it’s sort of a deadline for me. I absolutely want a child before I turn 30, but since I just went back to school that seems so unrealistic. I want to have my career figured out by the time I’m 30, but I suppose the whole back to school for nursing thing has that figured out. And I did get married in my 27th year so I guess I’m not doing too bad on my “list of things to have figured out before I turn 30”. I guess have 2 full years to get everything worked out and end my 20s with a bang! Regardless of my age, however, I always LOVE my birthday. Doesn’t it just feel so great to have a day, every year, dedicated to you?! Where everyone says nice things, maybe people give you gifts, take you to dinner?! I love it. 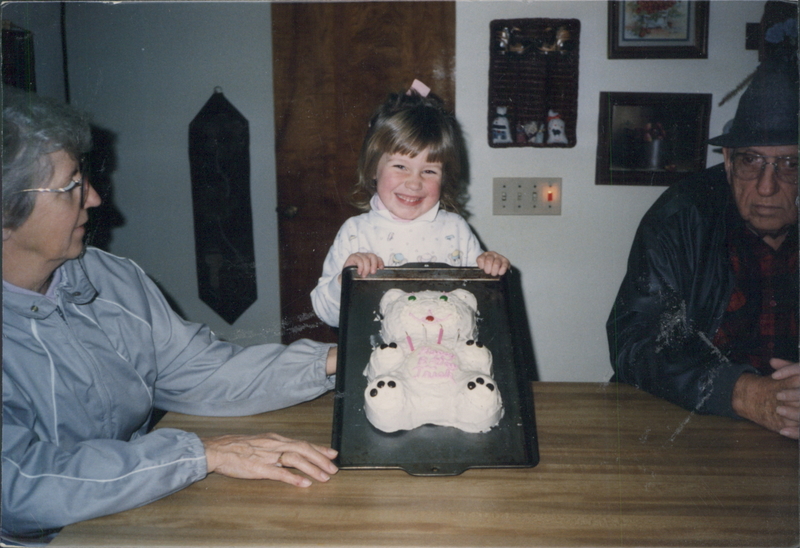 I always feel like I need to spend my birthday with my parents. Not just because they are awesome people, but because they are the awesome people that brought me into this world. 28 stinkin’ years ago. I don’t spend every birthday with them, but I try to do so when we can make it work. Tonight I’ll be heading to my hometown, which is also the home of American Players Theater. APT is known for their beautiful outdoor theater, set atop a hill in the middle of the woods, where classic plays are performed in the warmer months. But a couple of years ago, they added an indoor theater to their layout. Each Christmas, they hold performances of the classic tale, The Gift of the Magi. So tonight, the ‘rents and I are going to see the show. Hubby isn’t into theater so he’ll be having pre-show dinner with us and then likely warming up a bar stool for me at the local watering hole for a post-show beverage or two. I also love that my birthday falls between Thanksgiving and Christmas, it’s such a time for celebration. In honor of my celebration, I made some “Celebration Cupcakes” yesterday. People love Funfetti. I love Funfetti. But I don’t do boxed cake. So I decided to make my own version of Funfetti. I started with a basic white cake recipe from my favorite Betty Crocker Cupcake Book. 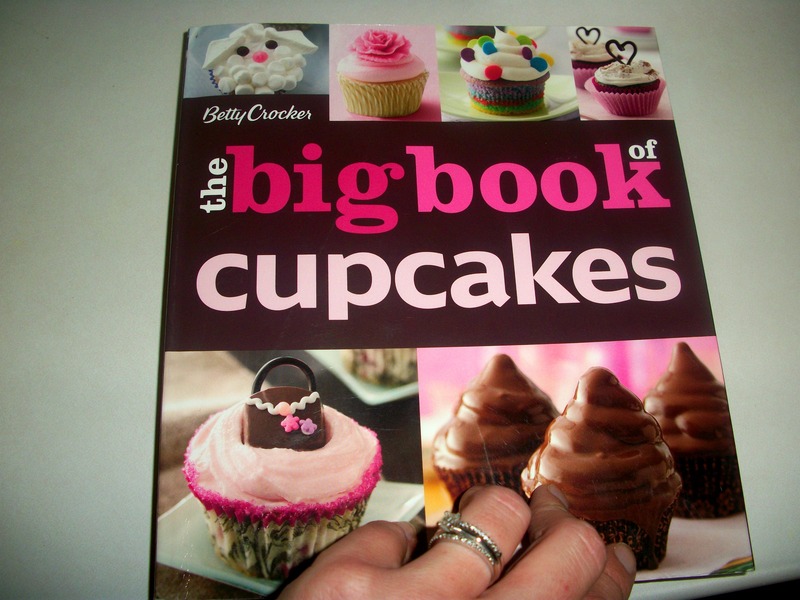 This book was a bridal shower gift, one of many cupcake-themed shower gifts I received. 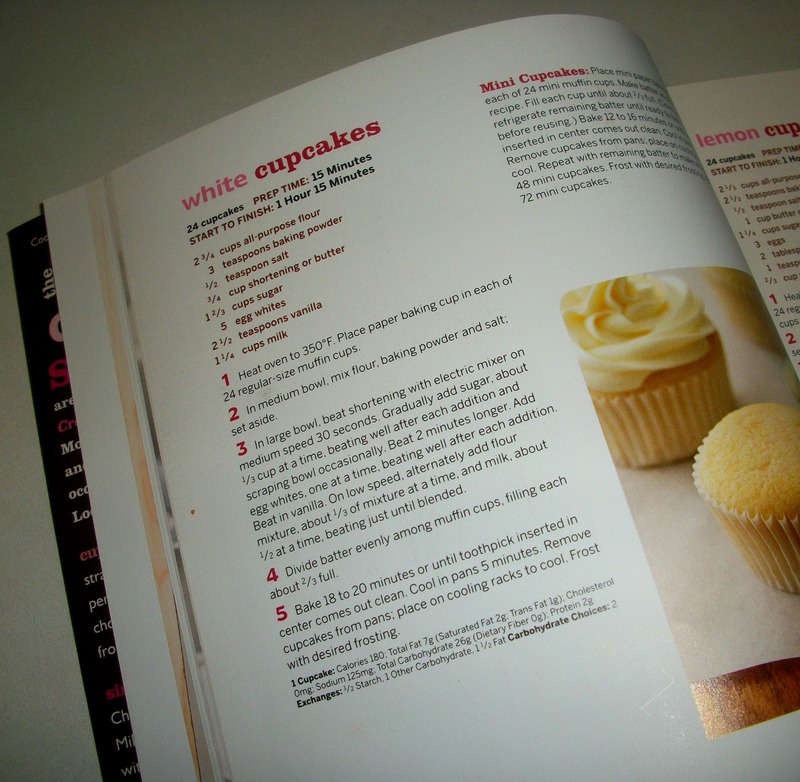 It’s chock full of fun cupcake ideas, but my favorite part is the first few pages which contain all of the basic cake and frosting recipes you could ever desire to have. I love to take basic cake recipes and then customize them to make what I want. Like Funfetti. I know the obvious solution would be to add jimmies to white cake, but I wanted to do something a little different. 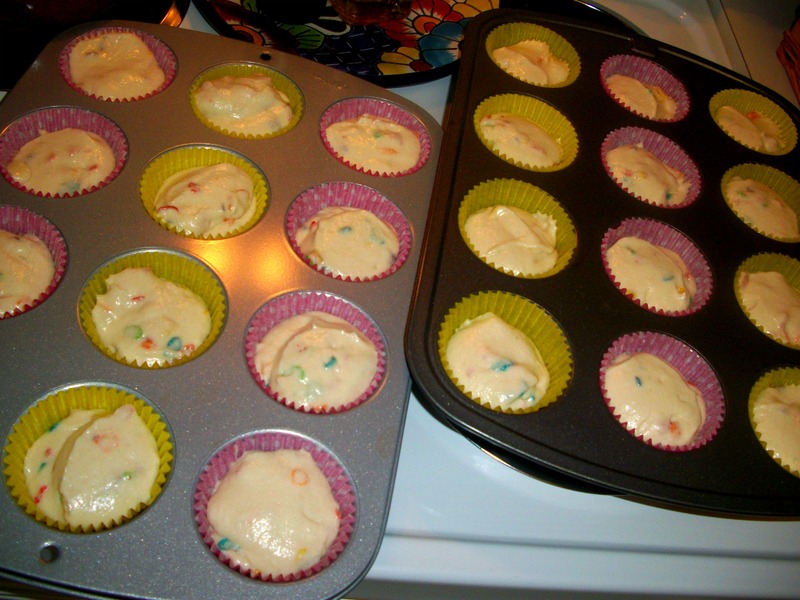 I used the most basic baking ingredients for a bright white cake, then jazzed it up with fun, flavory pebble cereal! 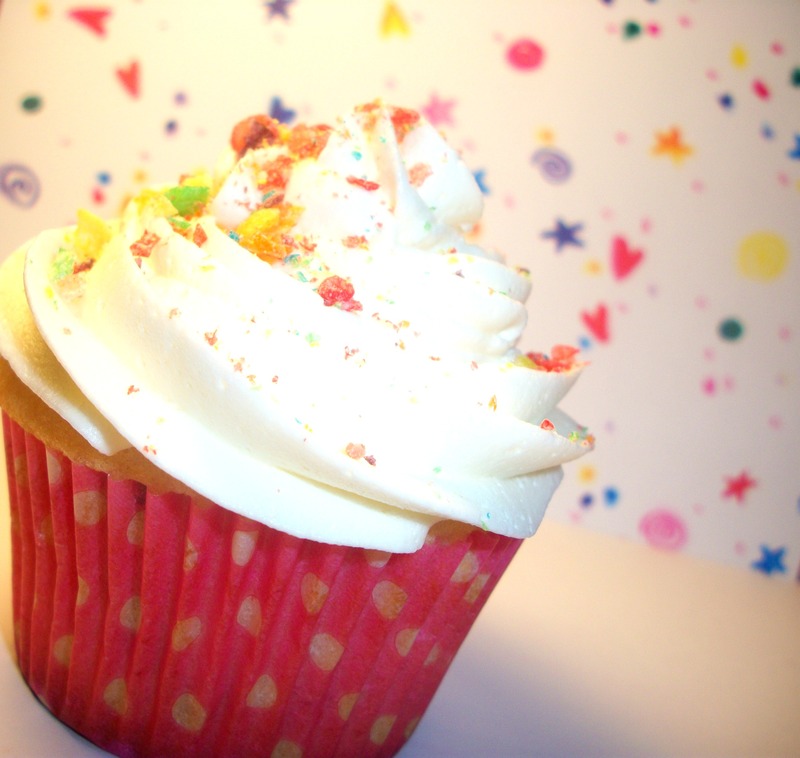 I filled some fun, celebration-looking cupcake liners with the yummy batter. 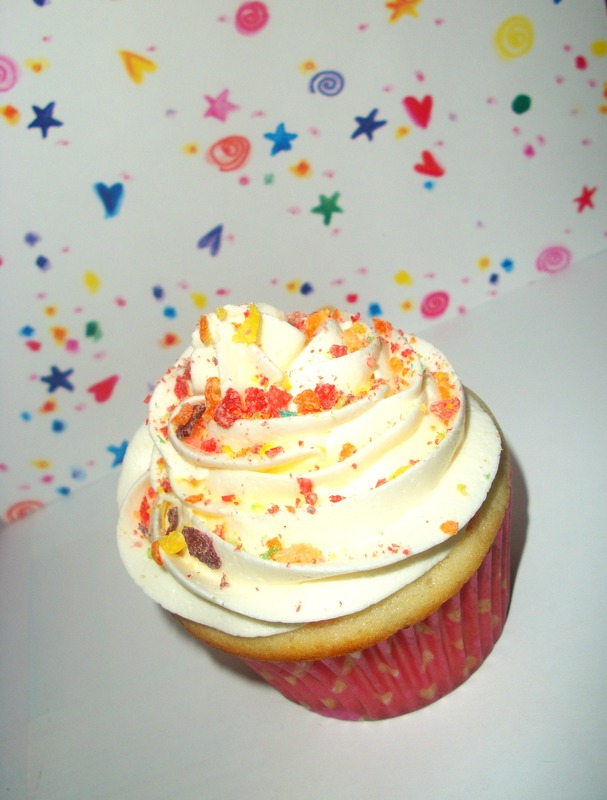 And I topped the finished product with a simple, perfect-for-piping, frosting and a dusting of crushed Fruity Pebbles. and one for me. Oh, I mean you. Maybe. It's my birthday. I don't have to share today. I took my treats into work last night, work is really much like elementary school ya know, and they seemed to go over well but I didn’t get as many “omg, those were awesome!” comments as I usually do. To be honest, I was a tad underwhelmed too. They were tasty, but maybe they could’ve used a few more pebbles. **my addition- 1 cup Fruity Pebbles, though I would probably increase this a bit if I were to do it again. 1.Heat oven to 350°F. Place paper baking cup in each of 24 regular-size muffin cups. In medium bowl, mix flour, baking powder and salt; set aside. 2.In large bowl, beat shortening with electric mixer on medium speed 30 seconds. Gradually add sugar, about 1/3 cup at a time, beating well after each addition and scraping bowl occasionally. Beat 2 minutes longer. Add egg whites, one at a time, beating well after each addition. Beat in vanilla. On low speed, alternately add flour mixture, about one-third at a time, and milk, about half at a time, beating just until blended. 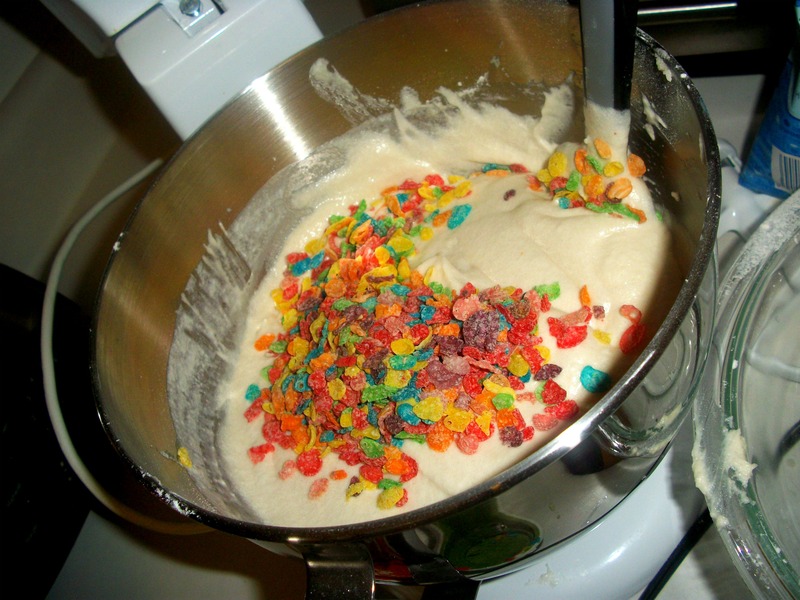 **Mix in Fruity Pebbles with spatula. 3.Divide batter evenly among muffin cups, filling each with about 3 tablespoons batter or until about two-thirds full. 4.Bake 18 to 20 minutes or until toothpick inserted in center comes out clean. Cool 5 minutes. Remove cupcakes from pans; place on cooling racks. Cool completely, about 30 minutes. Frost with desired frosting. 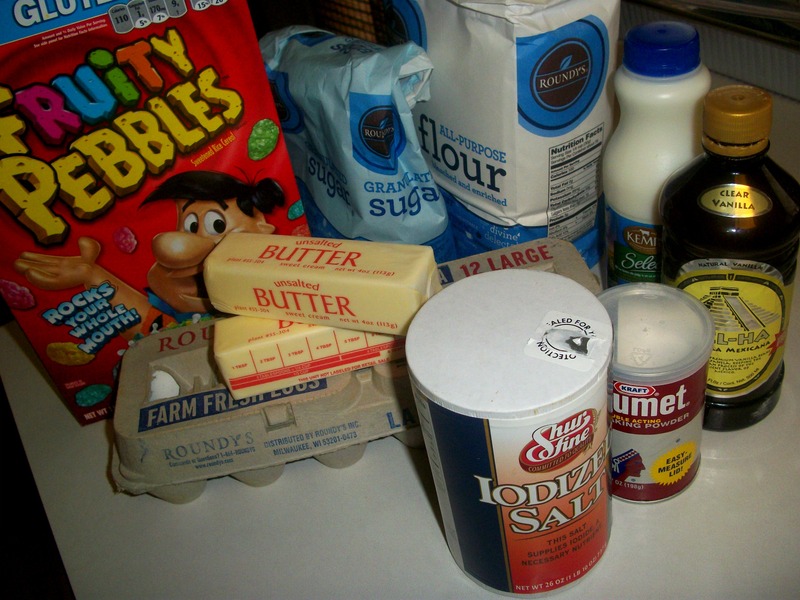 -If you plan to pipe your frosting, I would suggest doubling this recipe right off the bat. Probably enough here if you just plan to “spread” your frosting though. –Aaron Rodgers– This Packer QB holds a special place in the hearts of all Wisconsinites for making us Super Bowl CHAMPS last year! He and I were born on the same day, in the same year! Happy 28th Aaron! –Britney Spears– Brit Brit turns the dirty 30 today. A few years ago, the term dirty would’ve been pretty fitting, but I’m so happy that she seems to have turned her life around. I’ve always rooted for her, despite her failings. I understand she doesn’t make great music, but she does put on a good show and her beats can usually get my feet moving. –Nelly Furtado– Love her music, especially when she sings in Spanish. Plus, she is SO SO gorgeous! –Lucy Liu– HOW. ON. EARTH? is she 43 today? She looks 12. Way to go Lucy! Better yet, who do you like to share your birthday celebration with? Previous Post Day 3 Food and… Fitness?